Once a former Little Chef/Burger King combination site, this site is now home to your typical fast food restaurants where two major Lincolnshire roads meet. It's positioned on the A15. There was an old Little ChefHistory at Sleaford, which was demolished to make way for a new road. 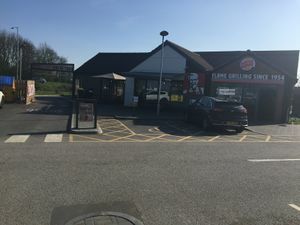 A new branch opened in 1990, gained a Burger King (with a planned drive thru never materialising) and then in 2002 it became a Little Chef Choices site with Caffè Ritazza and Harry Ramsden's menus. In January 2018 the Little Chef was moved over to a holding name, EG Diner. That and the adjacent Burger King franchise closed in May 2018, ready to be converted to a KFC drive thru. The KFC drive thru and a refurbished Burger King opened in June 2018. 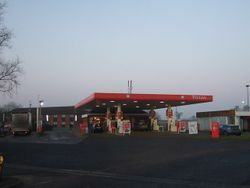 The filling station here changed from Total to Esso in early 2013. The brand then changed again in 2018 from Esso to BP.